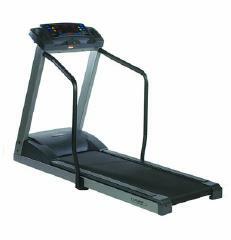 The Trimline T370HR treadmill is the high end state of the art heart rate controlled model from Trimline. It is the companyâ€™s most expensive HR unit but it is also their most powerful home treadmill. This treadmill is perfect for those who want a powerful treadmill with heart rate features. This unit has the most powerful motor in all of Trimlineâ€™s home treadmills. It boasts a 3.0HP continuous duty US made drive motor that can reach up to 11 mph and 12% incline. The 7 preset and 3 custom programs give you more workouts to choose from. Or, if you want, you can use an optional heart rate chest strap and do any of the 2 heart rate programs that are also built into this treadmill. The Walk, Jog, Run speed quick keys as well as the Hill, Mountain Pass, Peak elevation quick keys can be customized to meet your needs. This feature is perfect for those who use interval training in their workouts. It allows you to change your speed and/or incline with a simple push of a button. The 5 Window LED plus a 10 x 21 tri-color dot matrix visually displays course profiles to see upcoming hills and other challenges while the LED displays provide feedback on time, speed, distance, incline, calories, pace, cal/min, and heart rate so youâ€™ll know all the information youâ€™ll need to adjust your workouts. The 20 x 57 inch reversible phenolic deck surface features an orthopedic belt. This belt is softer than ordinary belts permitting the feeling of walking on grass or turf.